← Will Rover Ever Forgive Me? Today, May 30, 2011, marks forty-two years and ninety-three days since Spec. 5 David Charles Marshall Jackson and thirteen other souls lay dead or dying in Cu Chi, Quang Tri Province, South Vietnam. They were killed when Vietnamese forces overran their camp to attack and destroy 12 Chinook helicopters based there. Details of the firefight are hard to come by, but one source stated Specialist Jackson was actively engaged in the fight when he was felled. These fourteen are among the 58,267 memorialized at the Vietnam Memorial in Washington, D.C. Each of them has a story that deserves to be told. Only David’s can be told here. David did not need to die on that dark February night. At least, he did not need to die in Vietnam. He started his military career in Germany, and could have stayed there for several years if he wished. However, David was never one to pass up a good fight, and he grew tired of the spit, polish and boredom of serving in Europe. After a few months, he volunteered for Vietnam, setting boots on the ground April 9, 1968. David came by his desire for change and action honestly. His childhood was, to say the least, a little unstable. While some folks live in the same house for most of their childhood, David did not have that luxury. David and his family were urban nomads, roaming west Tarrant County, Texas like Bedouin’s in the Sahara. His family seemed to think roots were for other folks. They pulled up stakes and moved every year or two. During the fourteen years David was in Texas, he lived in Benbrook, Azle (twice), White Settlement (three times), Lake Worth and various locations in west Fort Worth. It was hard to be bored around the Jackson home. If the family was not packing and moving out, they were moving in and unpacking. Between moves, David’s father did his best to keep things interesting by changing careers, changing interests and changing dreams like some people change shirts. The result, in David’s case, was a lack of focus and a need for stimulation. This translated into any number of risky pursuits. David was a horseman, hunter, fighter and serious lady’s man by the time he was sixteen. If he was afraid of anything, he hid it well, and that lack of fear, and common sense, kept him in trouble most of his teenage years. The beginning of the end for David was his parents’ split in 1964. David went with his father and his future stepmother. They moved to Indiana where David had been born and his father had family. David did not finish high school, and settled for a GED. He enlisted in the Army as a way to learn a skill or trade. A few months later he was in Germany, by April 1968 he was in Vietnam. Vietnam seemed to be good for David in some ways. He learned that risk taking and an adrenaline rush are not the only things there are in life. Being David, he had to learn those lessons the hard way. If his letters and messages can be believed, he volunteered for every dangerous assignment that came along, almost paying the ultimate price for his adventures on more than one occasion. However, his last few messages seemed to show he was growing up. They stressed how he was looking forward to settling down and having a career when he got home. On the night of February 26, 1969, David was twenty-eight days from returning home. He was secure in his base camp. He was miles from the front lines, such as they were in Vietnam. Unfortunately, someone forgot to tell the Viet Cong and North Vietnamese the camp was a safe area. David was a little brother, a loving son and a man whose full potential was never realized. May he and his comrades in arms continue to rest in peace. 1 This information was provided to David’s family at the time of his death, but subsequent information leads this writer to believe this may have been his regular assignment at the time. Some information in this article was obtained through www.patriotfiles.com and www.findagrave.com. Gallery | This entry was posted in Vietnam. Bookmark the permalink. interest.I borrowed from your “Lest we forget” essay and I footnoted it. I am in no way trying to upset anyone. Thanks for the heads up. I’ll check it out over the weekend. Eric – Thanks so much for sharing this information about your brother, and for getting the correct photo(s) submitted to his VVMF web page. I have been working on finding photos primarily for our Indiana casualties, but will search wherever a lead will take me. I have added David’s photo to a FB Page I created to help promote the VVMF’s search for photos. 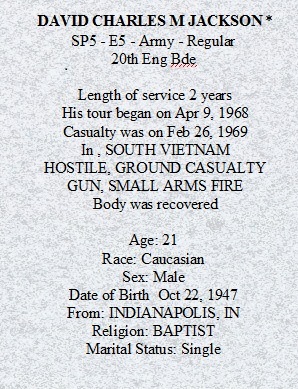 https://www.facebook.com/pages/Putting-A-Face-With-A-Name-for-Our-Hoosier-Vietnam-War-Fallen/370867646317616?ref=setting If you have the opportunity, I hope you will view David’s and some of the other heroes that we have found, or been provided photos.